I decided that I wanted to be an airline pilot when I was 8 years old and that gave me the distinct advantage of being able to plan the path to my future career from a very young age. I always knew what I wanted to do, but there may be those of you out there that aren't sure and are looking for more information. I will try to give you a view into the life of an airline pilot and the road that may lie ahead for you! The first question is do you REALLY want this job for right reasons? A pilot for a major airline can make over $200,000 per year, fly to exotic international destinations and have 45+ days of vacation. Does that sound good to you? Before you get too excited, you must realize that for every one of those individuals, there are hundreds of pilots flying for under $30,000 per year, 10 days off per month, tens of thousands in student loans, commuting across the country to sleep in crowded crash pads and working over most weekends and every major holiday. The reality for most lies somewhere in the middle. Now for the good news....airline pilot hiring is starting to pick up again after years of furloughs and thousands of pilots put out of work. The future is starting to look a lot brighter! So do you want the job? First, what is life as an airline pilot like? I fly for United Airlines. I'm a first officer on the B-757/767 and I'm about middle of the road seniority. The first and most important thing you need to know about he job is that the day you're hired you will get a seniority number. That position on the seniority list will mean everything to you. It determines what equipment you can bid (bigger the airplane, bigger the paycheck), what domicile you can bid (more senior and you can be based in the more popular domiciles) and what schedule you can hold (weekends off, holidays off, summer vacations, no all-night flying, etc.). Bottom line...you should try to get hired with your airline of choice as quickly as possible to secure that number! The only way your seniority increases is by pilots above you retiring or your airline expanding and hiring more pilots below you. Once you're hired most pilots' lead similar lives. You are awarded an aircraft type and domicile and start an intensive 4-6 week training program at the airlines training center. When you complete training you will be scheduled for a 3-4 day trip with a line check airman. If all goes well within two months you'll be flying the line. Roughly the first week of every month you'll "bid" or set up criteria for your next month's schedule (which days off you want, where you want to fly, how many hours you want to fly, etc.). The list of criteria can be mind-boggling but in most cases you'll ask for your every desire in the computer and be lucky if you get some of it (if you're in the top 10% on your airplane and seat, you stand a good chance of getting what you want). We typically know our schedule by the middle of the month for the following month. If you're senior enough to be awarded a "line" of flying you will most likely fly around 80-90 hours per month. We are paid an hourly rate for that time and the only time that counts is the time from gate departure until parking at the destination. Time spent between flights and away from home can be paid based on some duty and trip "rigs" but you generally get paid what you fly. We average 11-14 days off per month and most pilots will fly several weekends and most holidays unless you are senior. This usually means four 4-day trips (for me) with 2-4 days off between trips. Some senior pilots can get weekends off and choose to only fly 60-70 hours with 16-17 days off. If you fly international, the trips will generally be longer (3-6 days) and you can end up with only 3 trips and 15 or more days off. Pilots who are in the bottom 10-20% on their seat and equipment will generally be awarded a "reserve" line. You will be on call for 5-6 days and then get 2-3 days off. Reserve pilots are assigned trips with a minimum of 13 hours' notice if you're on long call or you can be assigned a short call in which case you are given a window to be available and must report quickly if called (usually within 2-3 hours). Reserve pilots may be utilized a lot, or not at all, depending on the weather, sick calls and time of year (you will be used more during busy summer travel months and sometimes not at all during slow months). You are always guaranteed a minimum pay depending on your contract (usually 70-73 hours). You may occasionally be assigned a "field standby" which is a block (usually 4 hours) that you sit in airport operations awaiting a short notice assignment. In all cases the FAA requires a minimum of 8 hours off in any 24 hour period. Time spent on short call or field standby is considered duty time and you will usually be limited to 14 hours of duty time (rarely you can elect to waive it to a maximum of 16 hours). A typical day for a pilot will be 6-13 hours and you will fly 1-4 flight segments during that timeframe. When you're not working you will a have a layover. Layovers shorter than 14 hours are typically at an airport Marriott, Doubletree or similar hotel. Longer layovers are usually required by your contract to be at a downtown location where food and some entertainment are readily available. Transportation to and from the hotel is scheduled to get you to and from the hotel in a timely manner (our contract requires that our transportation to the hotel pick us up within 30 minutes of the plane parking at the gate or we can take a cab and expense it). Vacations are bid like everything else (according to seniority)! If you have 30 days of vacation you will be required to bid it in 7-10 day splits (ie - you can bid for all 30 days at once or you can bid for 3, 10 day vacations). Senior pilots are more likely to get summer and holiday vacations while junior pilots will get the off months like Sep-Oct and Jan-May. 60% or more of vacation is awarded in January for the year and the rest can be bid in monthly vacation bids (30-60 days prior). Some junior pilots may have vacation that remains unassigned and the company can then assign you "involuntary" vacation in certain circumstances. Flying standby for free is one of the benefits of working for an airline. Pilots and their families (wife, dependents and one set of parents) can fly standby by simply listing for a flight and showing up at the airport. This benefit has lost much of its luster in recent years with very high load factors and full or oversold flights. You must be prepared to check the loads regularly and, in cases of bad weather and canceled flights, it's not uncommon to be stranded or have to look for alternate routes to get you to your destination. Flexibility is key and you never know for sure that you're on the flight until the door closes and the airplane pushes back. Pilots have the added benefit of being able to sit in the cockpit jumpseat. The captain is the final authority on this privilege so you must always introduce yourself and ask permission to jumpseat. This benefit is critical to pilots who don't live in their domicile and have to commute to and from work. Some airlines also offer "buddy passes". You may have several of these that you can give to friends, etc. These are also standby passes but with the lowest boarding priority. They usually also involve a charge depending on the length of the flight (anywhere from $10-$200). Benefits for pilots also include several choices for medical plans, long / short term disability and a 401k plan (Most airlines no longer provide a defined benefit or pension plan). My plan at United is excellent with the company contributing 15% of my pay to a 401k with no requirement that I match). Medical benefits that used to be free are now costing several hundred dollars per month so that benefit has also been eroded over the last 10 years. By far the biggest benefit in my book is that you get to fly a shiny new jet and have an office with an incredible view! Traveling is something I enjoy and, for me, the benefits outweigh the negatives. The job is not always glamorous and you will have some long, arduous days but I generally love my job. I rarely, if ever, see my boss and I don't take work home with me. I have the advantage of being able to show up for work, fly, and then leave it all behind at the end of a trip. If I don't particularly like the person I'm flying with I don't worry about it too much because next week I'll be flying with a new Captain. I rarely fly with the same person more than 2 or 3 times per year. In short, for me it beats the 9-5 grind in an office any day. However, you must have an understanding wife and family who realize you will be missing holidays, birthdays, most of the neighborhood parties on the weekend and you will be gone for days at a time. If you have that...it can be a terrific job and lots of fun! So you've decided to go for it! How do you get there from here? First, if you're in school....take lot's of science and math and work to get good grades. You will definitely need a college degree but it doesn't have to be in aviation or aeronautical engineering. I would also recommend some extracurricular activities (team sports, Boy Scouts, Civil Air Patrol, clubs, etc.) The airlines are looking for well rounded, dependable individuals. They are also looking to see some leadership qualities. Academics is only one part of the equation. Remember, they are hiring future airline Captains and those are the characteristics you need to show them. Second, you need flight training. You can go the military route of the civilian route. Let's face it, flying is expensive! Just a private pilot's license can cost you over $10,000 these days. The military is one way to get excellent flight training and build hours and experience. You will have to get good enough grades to get into the Air Force Academy or go the R.O.T.C. route at a civilian university. Not all officers get into flight training so this is a route you will want to research thoroughly before you make the jump. The civilian route is also a great choice but will require some investment and potentially some student loans! You will have to get private, commercial, instrument and multi-engine ratings. At this point many pilots will get their CFI (certified flight instructor) rating and then teach at a flight school to build hours. Others will try to get hired flying for a small carrier and build time that way. 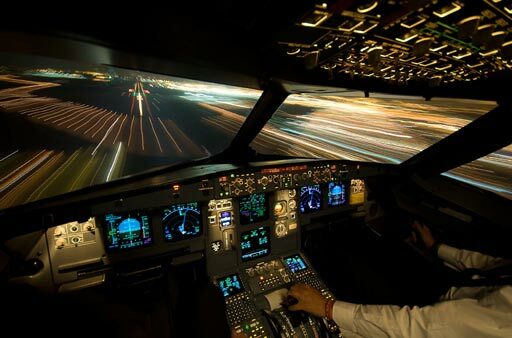 In either case, to get hired by a major airline you will need an ATP (airline transport pilot) license and this requires a minimum of 1,500 hours! Needless to say, building this kind of time requires a serious commitment and more than a couple years of starvation wages. I hope I've given you a glimpse into the life of an airline pilot as well as some pointers to help you attain your goal. It takes a serious commitment but half the fun is the journey. I always tell my kids, "Love what you do and you will never work a day in your life"!